Canine conditioning is fortunately becoming a popular activity. However, just as with people, each dog you work with is at a different fitness level. EXERCISING THE DOG IN FRONT OF YOU is key! I would love to go to an Olympic trainer who advertises they can make me a Lindsay Vonn, but let’s face it, I am nowhere near her level of fitness. If I tried to do the exercise routine she does, I would be definitely out of my league. More importantly, there is the strong possibility of an injury occurring to me and those around me since I am no where near her strength level. Making the decision to condition and strengthen your dog is an incredible one. It is an important activity to partake in for any dog, but especially a dog involved in performance activities. Movement is life to a dog – whether an eight-week old pup or a thirteen-year-old senior. Everyone feels better with some regular movement and there are so many benefits to gain by doing some basic exercises. Going back to my Olympic theme, Michael Phelps is a great swimmer. Part of that is definitely innate talent, but the other part is the strength and conditioning he is involved in before and after he is in the pool. There is a tremendous amount of conditioning needed to develop the strength, power and endurance required to perform his best — without it, his body may begin to break down and become injured. Denise Fenzi teaches a class titled Train the Dog in Front of You. I could not agree more, and this principle can be carried over to exercising. There are many plans, exercises, and cookbooks out there on exercising your dog. But are all those plans right for YOUR dog? It is always important to LOOK at the dog right in front of you. Ask yourself – what are the goals for your dog? Is your dog able to stand still? 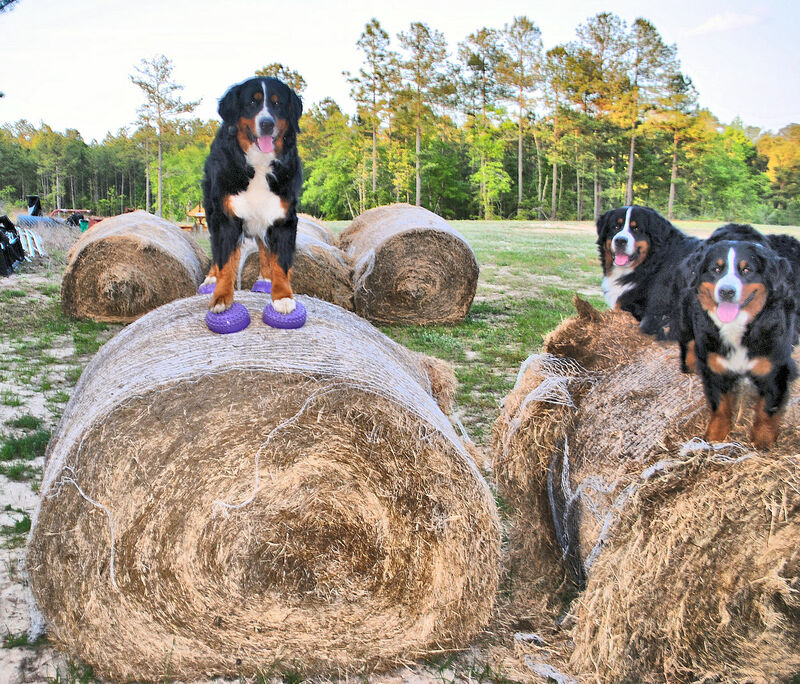 Does your dog have the endurance to complete the activities you are asking? Can your dog sit to stand without deviations? Does your dog have a long topline? Has your dog been cleared medically to perform activity? Is your dog at an age that is safe to perform exercise? Do you and your dog like exercise? One of the first exercises I begin with is standing still on a flat surface. Every dog I work with should be able to stand for at least ten seconds without moving, fidgeting, etc. If a dog cannot stand still, it may indicate many things, from discomfort or imbalance to lack of attention. Whatever the reason is, it needs to be worked through, but standing still is the first thing I will focus on. I begin with ten to thirty seconds and build up repetitions. For example, I will ask a dog to stand for ten seconds, up to ten times in one session. Once a dog can master a thirty second stand for up to ten times, we move to an unstable surface and begin again. While the dog is standing, I am looking for a level topline and any compensations in his body. Dogs place 60 to 70% of their weight on the forelimbs, and 30 to 40% of their weight on the hindlimbs. When the dog initially steps on an uneven surface, they will transfer more weight onto the forelimbs. As strength improves, the weight will balance out more. Endurance is very important. I often hear owners mention the dog does not do any exercise during the week, but then they will run agility over the weekend. This is a typical weekend warrior, and as with people, often results in injuries. Regular endurance exercises, such as walking, are so important to every dog whether they do activities on the weekend or not. Ideally, a twenty to thirty minute walk a day is wonderful and has many health benefits inclusive of weight maintenance, cardiac, musculoskeletal, and mental stimulation. An easy Sit-to-Stand exercise is a great method to determine if the dog has any weakness or structural issues. The sit should be slow and controlled. It is much more difficult to slowly sit with control then to sit quickly. When the dog stands, the hindlimbs should extend with control. If the dog sits with one leg kicking out to one side, it may be a sign of a hip or knee issue. This should be looked at to determine what the cause is. If the dog cannot maintain a straight topline, it may be a sign of weakness or a structural issue. This should be examined, as well. Does your dog have a strong topline? And is it longer than normal? For example, some breeds have long toplines by nature such as the Dachshund, Basset Hound, Clumber Spaniel, and others. A long topline is a fact of life for many dogs, but strength is not always a fact. It is something that needs to be worked on. Core strength is paramount for long backed dogs, especially those involved in any sport or exercise program. Extreme jumping and weaving may not be appropriate for these dogs. I personally do not ask a long backed dog to perform certain exercises, such as sit pretty, handstands, or uncontrolled dancing. This is due to the assumed stress on the spine and problems I have seen in my clinical practice. Some dogs may have medical reasons requiring limitations or precautions. These reasons may include anything from musculoskeletal diseases such as arthritis, endocrine diseases like Addison’s disease or cardiac and pulmonary disease. Most dogs with medical conditions can be exercised with respect to the disease or condition, but do require a professional. Age is always an issue with regard to exercise. In young dogs, the growth process needs to be respected. Growth plates do not close in many dogs until between fifteen and twenty-four months of age. Jumping, extremes of movement, and repetitive running is not advised with young dogs. Running three miles with a one-year-old Labrador retriever may seem like a good idea at the time to burn energy, but that running may catch up with the retriever when they are a bit older in the form of arthritis. It may catch up sooner with growth related problems. Older dogs, over the age of seven to ten, depending upon the breed, have special needs of their own. Musculoskeletal, cardiac, pulmonary and other systemic limitations must be considered. An older dog that loves running may need you to set the boundaries. Just because they have always done the running, does not mean they should continue at the same pace. Some dogs are just not into exercise and activity. There may certainly be an underlying issue why they aren’t and that should be explored. I have also seen dogs that are just not into activity, and have no other desire than to hang out with their owner. As long as they are happy and healthy, that is fine. 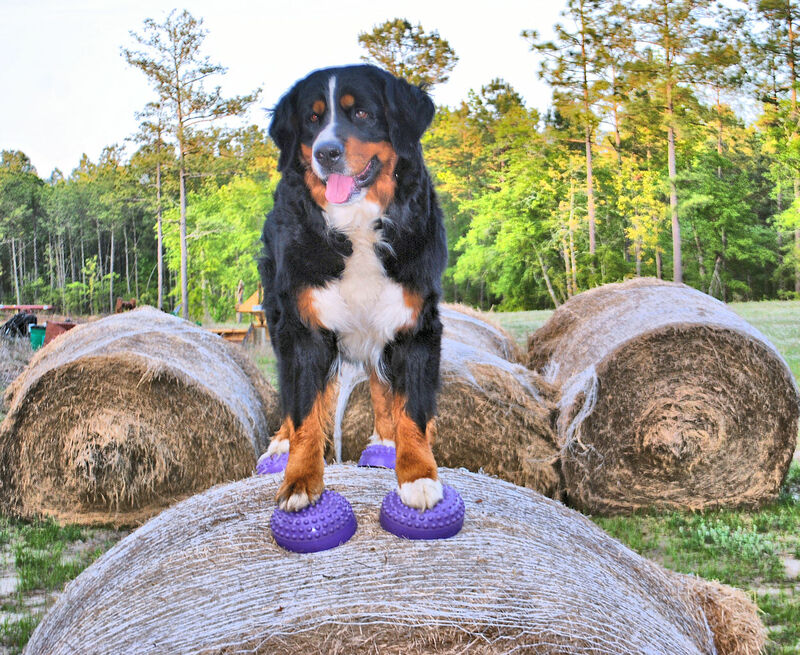 I have also seen many owners not really into exercise who are just trying it with their dog because they were told it was a great thing to do. Well, it is a great thing, but if it is being forced by you onto the dog, and you really do not like it, do not bother. It can cause negative repercussions down the road. A dog in pain should never be asked to exercise. The first step is to find out why they are in pain. Lameness, refusal of activity, decline in performance, or refusal to move are signs of pain. Very simply, if a dog is in pain, the muscles do not function properly and this will lead to more problems. It is simple – if you suspect pain – find out why and stop any activity. I always assume a physical cause rather than a behavioral with any training or performance problems. Look at the dog you want to exercise. You may want your dog to run ten miles with you, but in reality an overweight ten-year-old Labrador retriever may not be your best running partner. There are other more suitable conditioning activities you can do with the dog besides running. A St. Bernard may not be the most appropriate dog to do sit pretty’s if they cannot perform a sit to stand perfectly and in control. Ultimately, we want our dogs to have the best quality of life for the longest time possible. EXERCISING THE DOG IN FRONT OF YOU is an important element in achieving that. IF and WHEN YOUR DOG is ready, there are all sorts of FUNctional FITness exercises that can be done with him. Read through our other TotoFit blogs for a few ideas! « TOTO FIT – The Real Deal ! !